Since 1997, Laser Man of Connecticut, a certified Hewlett Packard Repair Service, has been serving Connecticut businesses in Fairfield County with his staff of Dedicated and Experienced Technicians. We Service Most Models of Laser Printers and Laser Fax Machines. 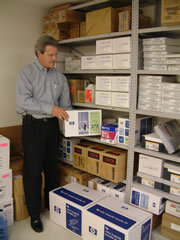 We Carry a Full Line of Laser Printer and Fax Toner Cartridges and Products. We Proudly Serve Lower Fairfield County, Connecticut. • FREE Quarterly Cleanings of your Laser Printer or Laser Fax. • FREE Pickup and Delivery. • FREE On-Site Inventory Control. • 100% GUARANTEE on Laser Printer Parts and Service. • HUGE Supply of Parts In-Stock. 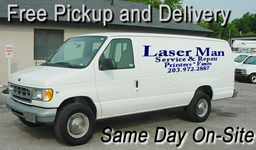 Laser Man of Connecticut's Expert, Friendly Staff will meet you On-Site for all Laser Printer Repair, Service, Supplies, Toners and Maintenance. 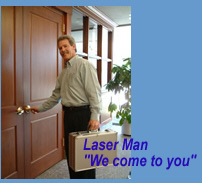 You'll NEVER RUN OUT of Laser Printer and Laser Fax Supplies with Laser Man's On-Site Inventory Control System. • Laser Printer and Fax Repair. • Laser Printer and Fax Service. • Laser Printer and Fax Maintenance. • Laser Printer and Fax Supplies. • Laser Printer and Fax Toners. CALL NOW FOR THE BEST PRICES ON LASER PRINTER SUPPLIES AND TONERS IN FAIRFIELD COUNTY! 1) FREE Cleanings of all Laser Printers and Faxes. 3) FREE Pickup and Delivery. 4) COMPETITIVE PRICES on all Products and Services. 5) LOCAL and DEPENDABLE SAME DAY Laser Printer Repair, Laser Printer Service, Laser Printer Supplies, Laser Printer Toners and Laser Printer Maintenance. 7) Hewlett Packard (HP) AUTHORIZED Expert Technicians. 8) FULL LINE of Printer Maintenance Kits. 9) YOUR Company SAVES Time and Money. 10) OEM and Compatible Products. CALL US! "WE COME TO YOU!"